Powers/Abilities: Thanks to years of training and discipline, the Big Question is an extraordinary hand-to-hand combatant. These fighting skills, coupled with unusual agility for a man his size, compensate for Fisk's lack of superhuman strength when engaged in unarmed combat. The Big Question is a respected practitioner of Judo, taught to him by a blind man who goes by the name of I Ching. Although the Big Question is a brilliant Machiavellian strategist, he is somewhat limited by his obsession to undermine his own success by planting clues to his next move, alerting his enemies to his traps and schemes. (Assassins #1 (fb)) - Edward Nigma Fisk was elected the Mayor of New Gotham, despite the fact that he had a record as a convicted felon. As the "big man" in the city of New Gotham, Fisk reigned as the quizmaster crimelord supreme. (Assassins#1 (fb)) - The Big Question captured the meddlesome assassin known as Dare (Slade Murdock) and subjected her to a "government" experiment. Calling her a "daredevil", the Big Question had his surgeons implant two horns on her head so that she could look more like a true daredevil. The radioactive chemicals used in the experiment caused Dare to permanently loose her eyesight. (Dare the Terminator #7) - The Big Question made his first on-panel appearance and faced off against his old nemesis, Dare. (Assassins#1 (bts)) - Years later, facing mounting rumors that he was under the influence of the mysterious mystic known as Doctor Strangefate (who also resided within Arkham Tower), the Big Question devised a brilliant plan to rid himself of Dare and Catsai while at the same time save his tarnished reputation. Keeping his identity a secret, he hired Dare and Catsai to come to Arkham Tower and assassinate the Big Question. He would then have Dare and Catsai killed and claim that Dr. Strangefate enchanted them to murder the Big Question. 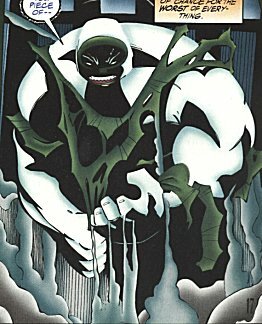 By butchering Dare and Catsai, the Big Question would thus cause his reputation to be reborn and prove to New Gotham's public that he was New Gotham's true power. And even if Dare and Catsai did manage to kill him, then at least the Big Question would be killed in a fight and not as some magician's stooge. (Assassins #1 (bts)) - The Big Question hired three of New Gotham's top assassins, Deadeye (Bill Lawton), Lethal (Sergei Minerva) and Wired (Nathan Chase), and instructed them to kill Dare and Catsai when they came to Arkham Tower to make their hit. (Assassins#1 ) - "Political Suicide" - As Dare and Catsai battled their way to the top of the Arkham Tower skyscraper, the Big Question watched them on a security monitor from the comfort of his penthouse suite on the 107th Floor as he eagerly anticipated their arrival. Later, the Big Question was watching the WNGN News when reporter Jimmy Urich came on air with an editorial. Urich criticized the Big Question's corrupt administration and asked why New Gotham has a convicted felon in office. Finally, Urich suggested that the Big Question was being manipulated by the mysterious Dr. Strangefate, and claimed that the only reason Fisk got elected was so that Strangefate could play puppet-master. Infuriated, the Big Question smashed his television screen to pieces with his bare fist. Dare and Catsai eventually reached the 107th Floor where they were confronted by the jovial Big Question, who revealed to them that it was he who hired them to kill him. The Big Question spelled out his grand scheme: he would kill Dare and Catsai and claim to New Gotham's public that Doctor Strangefate enchanted the assassins to murder their beloved mayor. By butchering Dare and Catsai, his reputation would be reborn. An enraged Dare leapt forward with her sword drawn. But it was a trap -- a metal door slammed shut between Dare and Catsai, leaving Dare and the Big Question alone in one-one-one combat. The Big Question blocked all of Dare's attacks and then ripped the surgically-implanted horns from her head, leaving the female assassin for dead. The Big Question then prepared to do the same to Catsai, who was still on the other side of the metal door. But Catsai had other plans. She had one of her pet cats sneak through a ventilation duct and plant an explosive device on the other side of the door. As the Big Question approached the door, the device exploded, shredding the Big Question's clothing and tearing a huge whole in the door. With the Big Question still reeling from the blast, Catsai used her ninja skills to make short work of New Gotham's mayor. But rather than killing the Big Question, she hung him from the antennae at the top of Arkham Tower and called Jimmy Urich. The negative publicity stemming from Jimmy Urich's front page exposé seriously damaged the Big Question's political career. The Gotham Bugle is one of New Gotham's major newspapers and is run by J. Jonah White. Jimmy Urich's front page exposé bringing to light the Big Question's (E. Nigma Fisk) activities severely damaged the mayor's reputation and political career. The Gotham Bugle is an amalgam of The Daily Bugle of the Marvel Universe and The Gotham Gazette of the DC Universe. 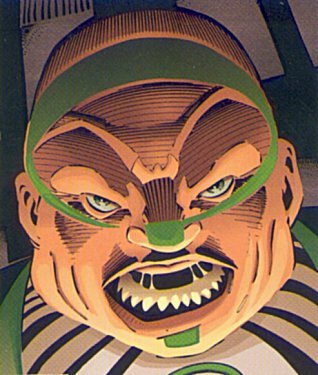 I Ching is an Amalgam Universe version of I Ching of the DC Universe. Jimmy Urich is an investigative television / newspaper reporter based in New Gotham and a constant thorn in the Big Question's side. In ASSASSINS #1, he gave an editorial report on WNGN News criticizing the Big Question's mayoral administration. 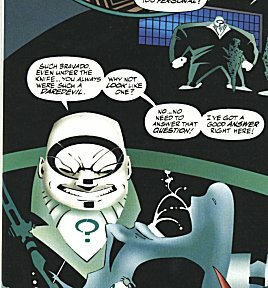 Furthermore, Urich suggested that the Big Question was being manipulated by the mysterious Dr. Strangefate, and claimed that the only reason Fisk got elected was so that Strangefate could play puppet-master. Later, Jimmy Urich received a tip from Catsai (Elektra Kyle) that led him to discover a badly beaten Big Question hanging from an antennae on the top of Arkham Tower. 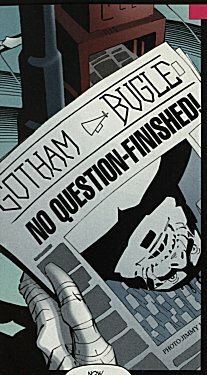 Jimmy Urich's story made the front page of the Gotham Bugle and seriously damaged the Big Question's reputation and political career. Jimmy Urich is an amalgam of Ben Urich of the Marvel Universe and James "Jimmy" Olsen of the DC Universe. J. Jonah White is the editor-in-chief of the Gotham Bugle. J. Jonah White is an amalgam of J. Jonah Jameson of the Marvel Universe and Perry White of the DC Universe.